When my husband Les and I read an article in the Wall Street Journal about the documentary “Corridor of Shame,” we bought the movie and were deeply moved by the plight of Lowcountry children. We had no idea of the historically poor conditions and low academic performance of the area. We were appalled that so many children were falling through the cracks and we wanted to do something about it. Our backgrounds brought a unique perspective that we thought could be brought to bear. 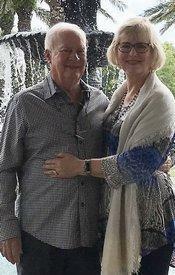 Both of us grew up in large families that had not much in the way of finances but had taught us the value of hard work, education, and helping those in need. From childhood, my dream was to become a teacher, so I pursued a career in education. Les started his first business while he was in school and went on to develop many successful businesses spanning a variety of industries over the years. I have an extensive background in education and administration. I hold a doctorate from New York University and have taught in middle and high school and at the college level. In addition, I served as a college administrator and as the director for curriculum and instructional development at the College Board—the AP and SAT people, working with teachers around the country in developing more learner-centered curriculum. I left the College Board to start a supplemental education business, with Les’s expert assistance. I worked with children and adults with disabilities and life challenges. Our business was so successful that we developed an education franchise. The movie “Corridor of Shame” turned our life upside down and headed us in a different path. In the latter part of our working career, we wanted to provide assistance to families who could not afford supplemental education or private school. So we set out with the passion to help public school children of the Lowcountry discover the “secrets of learning” so that they could achieve academic and lifelong success. For more than a year, Les and I traveled back and forth from New Jersey to the Lowcountry to meet with local school district superintendents along the I—95 corridor, the area described in the documentary. In the process, we approached Jasper County School District Board with a proposal to assist the district in improving educational opportunities for Jasper County students. We made presentations at several Board meetings and met with the Superintendent. Les met with numerous local business people and we held meetings with parents and community leaders to share our passion for children’s education and our educational approach to help the local school system. The Board rejected our offer of assistance. When a community member asked if we had ever considered starting a charter school, we decided to explore that option. Les met with the Director of the SC Public Charter School Alliance to understand the process and then he and I established Royal Live Oaks Academy of the Arts & Sciences, wrote the charter application with an educational program focused on a learner-centered project-based-learning focus. We formed a Planning Committee, met all over Jasper County with parents in community centers, fast food restaurants, literally anywhere we were allowed to share our vision and mission. We knew from experience that every child could be successful if educators started with their strengths instead of their weaknesses and tailored education to the individual needs of students. We presented our charter application to the SC Department of Education and received approval. We received our final approval in 2011, and used our own financial resources to plan and start-up the school as state and federal funding was being developed. Les and I approached Jasper County School District Board again to seek a site to build the school. We negotiated for the abandoned Bees Creek Elementary School, but we were turned down. A Board member mentioned the abandoned elementary school in Hardeeville, and we made an offer that was finally accepted. In August 2012 RLOA opened its doors.